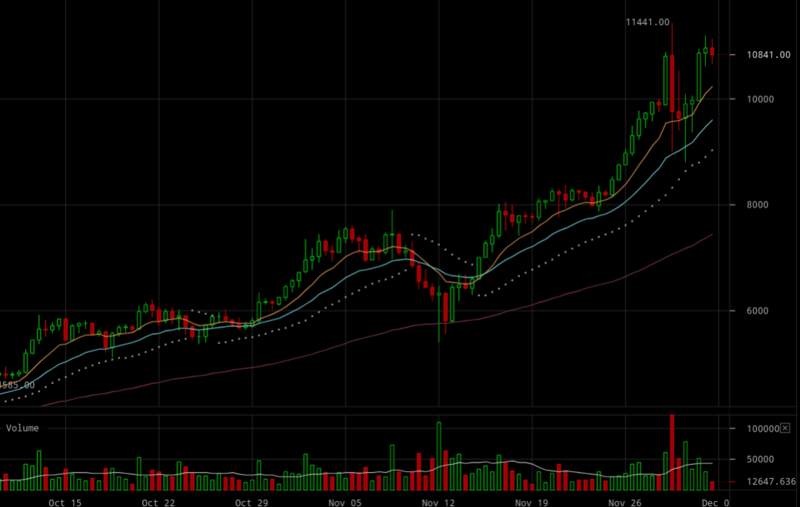 Arguably moon base has been reached with bitcoin’s crossing of $10,000 on November 29th. The swift sell-off that followed appears to have been brief, with the global market cap now back to near all-time highs of $330 billion. Trading volumes have fallen by almost half since, but with bitcoin returning back to near $11,000, it seems what we saw was just a correction, at least for now. Bitcoin’s price action since October. The story repeats across the board, with ethereum back to $450 after reaching an all-time high of $518. Its trading volumes have fallen considerably, however, to just a billion, while Bitcoin Cash now handles only slightly more than half a billion, quite a minuscule sum compared to the $4 billion it was managing previously. Something which might suggest there is reduced activity or that the trading frenzy has cooled down, at least slightly, although global volumes do remain at $11 billion. 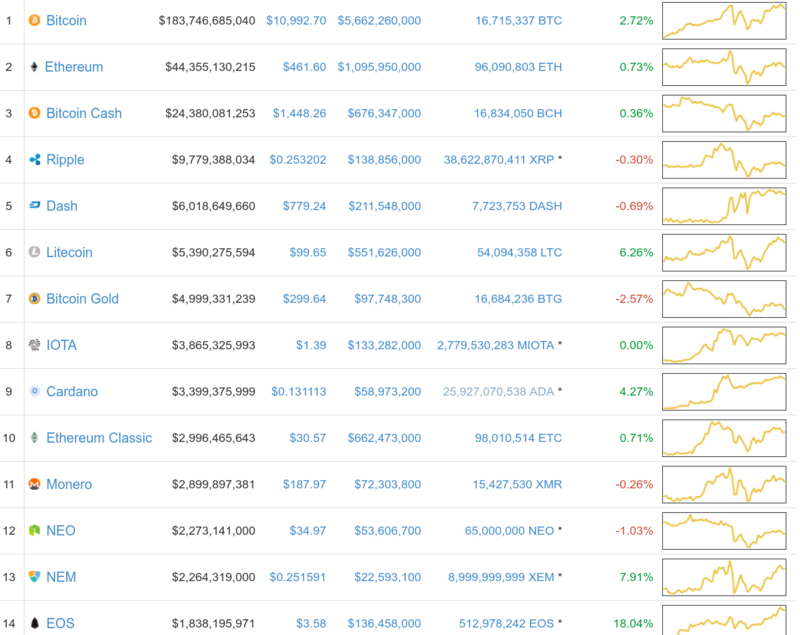 The current top digital currencies. As digital currencies did not crash down to earth after reaching moon-base, but seem to have landed in one piece after some turbulent pre-landing activity, the question is now whether they will settle down and form an outpost for Mars, or whether they have something else in mind. 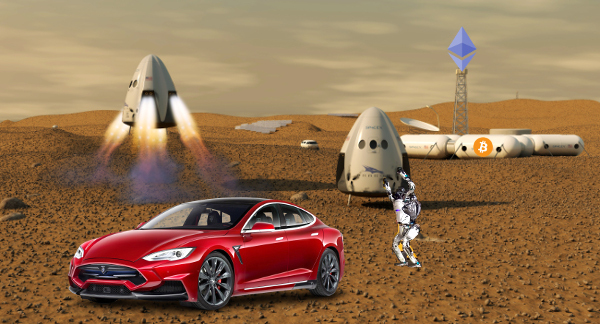 Robots driving cars on Mars might not be quite exactly what many had in mind when growing up in the 90s, but it isn’t too far off. Well then, if he can skip the moon base, maybe we can too. But it perhaps would be better if there was a connected system of rocket stops hoping through the planets off to the next solar system and then the next galaxy, forming a base on the moon, mars, and so on. Yet, who are we to tell Musk what to do with his shiny toys. If he wants to go straight to Mars, then so be it. We’ll just cool down at this moon base for now and see if we want to join.